Pounded Yam is one of the most loved Nigerian fufu meals. When it comes to fufu meals, Pounded Yam and Egusi Soup or Pounded Yam and Nsala Soup are favourite combos. But to pound the yam the traditional way with mortar and pestle takes a lot of energy and sweat. But your blender is here to rescue you from all that hard work. 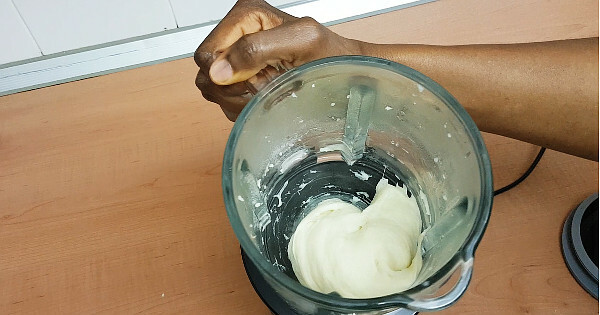 Yes, you can make pounded yam with a blender. And if you have a stand mixer or a food processor you are in luck because those two can also make pounded yam. Click here for details. And to make the pounded yam with a blender you will need a blender that is powerful enough to make it. As a guide, my blender that I used in the video below has 850W power rating. Even if yours has a lower power rating, try it with small qauntities of boiled yam cubes at a time and you will be surprised. If you have a stand mixer or a food processor, click here for how to make pounded yam with a stand mixer.